It's understandable, especially for a tourist whose main goal is checking into that cozy relaxing Cabin somewhere off a back road in Idyllwild, but you'd think at the natives would be more observant and in tune to there surroundings. How many have ever taken the same route day after day and actually noticed certain things that catch the eye and make you wonder ? I know, maybe at some time in the past you did, before modern electronics created a virtual world separating humans even further from the Natural World than they were before. You know, even way before Cell Phones and other sophisticated devices, when ordering a brand new vehicle, I opted for no radio. Everyone always thought I was crazy, but I enjoyed drives and being alone with my thoughts and observations. Whatever! Sadly, something has happened yesterday that will change this drive in some pasts forever. 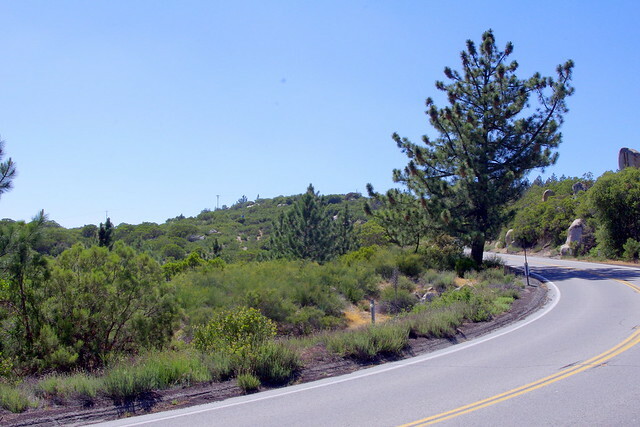 Fortunately, I stopped and took photos of areas this past April 2013, which had captured my interest on a number of occasions while commuting back and forth to Hemet California from Idyllwild before actually stopping to investigate further. This new "Mountain Fire" just may ruin at least one of these places and another incredible unique feature which I did not photograph as a result of dead Camera batteries. Below however is what is happening at present. The fire started on private property just off McCall Park Rd west of the Mountain Center of Hwy Jct 243/74. The scene above is easily identifiable to anyone familiar with this drive on Hwy 243. That concrete block and ornamental steel fence and Hemet styled house on the property with all the fake concrete Deer and other animals in the front yard landscape always seemed to be so out of place up there in these beautiful mountains. Further up and around the bend in this picture is a Propane Business & U.S, Forest Service Keenwild Fire Station. 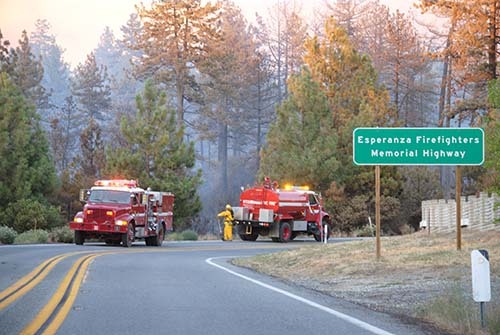 You'll notice the reference on the roadside sign which says, "Esperanza Firefighters Memorial Highway". This was another tragedy where human life was lost trying to save other's lives and properties. This seems to be an ever increasing tragic regular occurrence now days. NY Times - Oct 2006: "Burst of Wind-Driven Flames Engulfed Firefighters"
This is another location familiar location to area resident in Garner Valley at the old Garner Cattle Ranch entrance. 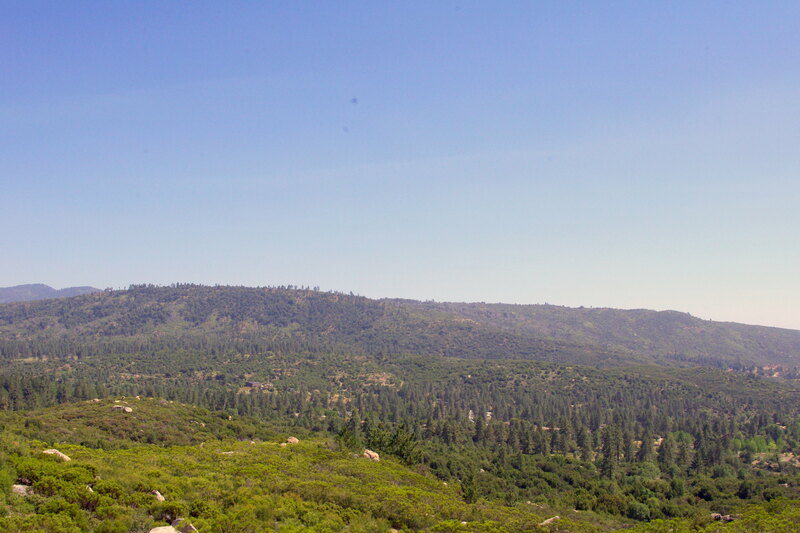 From what I understand this Garner Ranch now belongs to the U.S. Forest Service. As you can see, the fire has made a massive movement over Keen Summit and burning now down into May Valley above Hurkey Creek Campground near Lake Hemet. From there it will burn east towards residents of Apple Canyon and by the end of the week, if weather forecast for more Monsoonal weather patterns develop by Friday where Mountain Center is predicted to be in the 90s, this means a more southeasterly flow direction to the northwest which would push the fire up into Taqhuitz Peak and other areas west towards Idyllwild if the scenario is just right. I'll post some fire update links below in the references at the bottom of this post. First, here is a picture of a Coulter Pine tree which I guarantee you no one gives any thought to or even remembers anything about this tree and it's surrounding from the past. 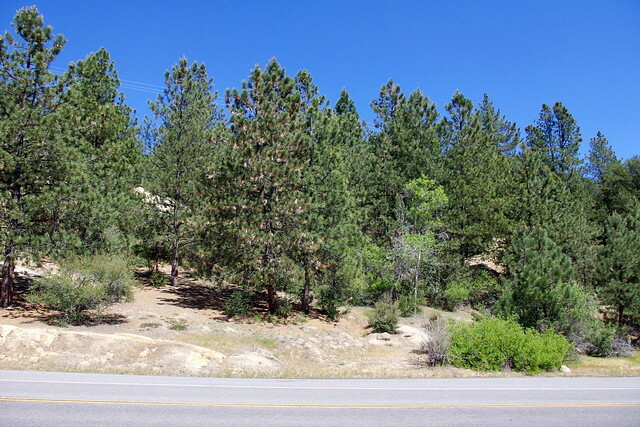 Yet back in the early 1980s, the land around this particular Coulter Pine had 100s of small Coulter Pine Saplings and bigger trees nestle within a cozy chaparral plant community environment. I had stopped once as I had previously admired the richness of this new forest spreading growth and walked around taking some pictures which were of the conventional Camera type, but now lost or buried who knows where in storage. Every tree was healthy and vibrant green. The numerous saplings even lined the road shoulder from that tree all the way to the left in this photo above. But then one day that all changed. For some Reason, the Forestry Department decided the chaparral was evil and strangling the Pine Saplings, so they had a program of chaparral removal by hand to save and protect the young Coulter Pine Saplings so they could grow without that aggressive competing chaparral hogging all the water and nutrients from these poor helpless Pine trees. Now, at that time, I didn't really know much about Hydraulic Lift and Redistribution and the mutualistic symbiosis which actually works and functions for the benefit of all plants, even though I had already practiced planting Trees previously utilizing large Chaparral plants as Mother Trees or Nurse Plants. Funny thing is months later trees began dying everywhere here. That's when it hit me that Mother or Nurse plants provide more than shade from scorching Sun and drying winds. It was then that I started looking at underground Networks. Irritated and upset by what was taking place, I approached Steve Raybould of the U.S. Forest Service who was boss over all Prescribed Burns and he said it wasn't the U.S. Forest Service, it was the California Department of Forestry. In that above photo, while you see smaller trees behind the large roadside tree and a few to the left in the photo, it's less than half of what was originally there. While it was sad, for me it was a complete turn around in my limited understanding and practice of importance of underground networks and above ground importance of chaparral in forest succession movements. This is a view from the same location, but turned around viewing the other side of Hwy 243. 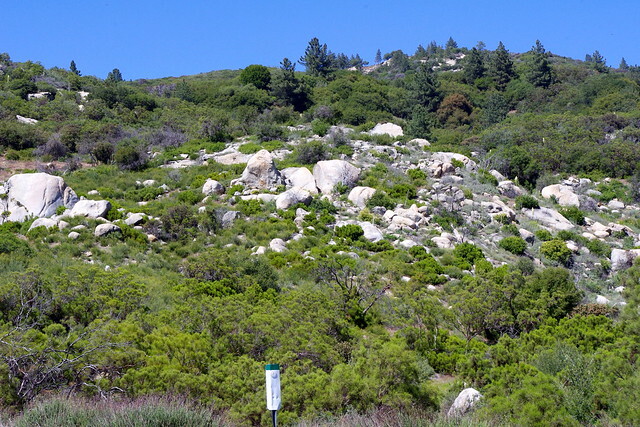 You can see that a combination of prescribed burning, hand cutting and other chain saw work is done to surround Idyllwild with what is supposed to be a perimeter barrier of fire safety. This is something we now know will do nothing in these modern times to protect properties in rural areas. In fact it has allowed patches of foxtails and other non-natives to invade what was once a hidden ground canopy which made it impossible for these invaders to get any foothold. Any potential fire will now actually be allowed to burn faster and farther than previosly. While chaparral does burn spectacularly high up in the air, it actually can burn slower allowing time for water and retardant drops. Grasses allow no such convenient strategic drop timing. You can never predict and get ahead of it. At that above location I've just described, the was a singular specimen of Redshank or Ribbonwood (Adenostoma sparsifolium) which had a singular large diameter thick trunk which didn't really finally branch out until well up the tree. This I actually saw in late April 2013 of this year. But incredibly what was even more amazing was a native Chaparral Honeysuckle which made the most perfect spiraled growth up that entire Redshank trunk and into the branches, but not really over whelming the small tree. My Camera batteries were completely out of juice at that point so I drove on thinking I'd come back and get the shot before I left to go back to Sweden. Never happened and now I fear that area may be totally gone forever now, but who knows for sure. Definitely the hwy regions south of this spot to Mountain Center are gone. Maybe some of those taller stick trunk pines escaped, much like the PÅines in the 1982 Mountain Center fire I wrote about here with "1982 Mountain Center Fire & the Forest's Regeneration" . Okay, shifting gears and moving further north towards Idyllwild on Hwy 243 just past the old original Land Refuse disposal site which is now apparently a green waste processing center. 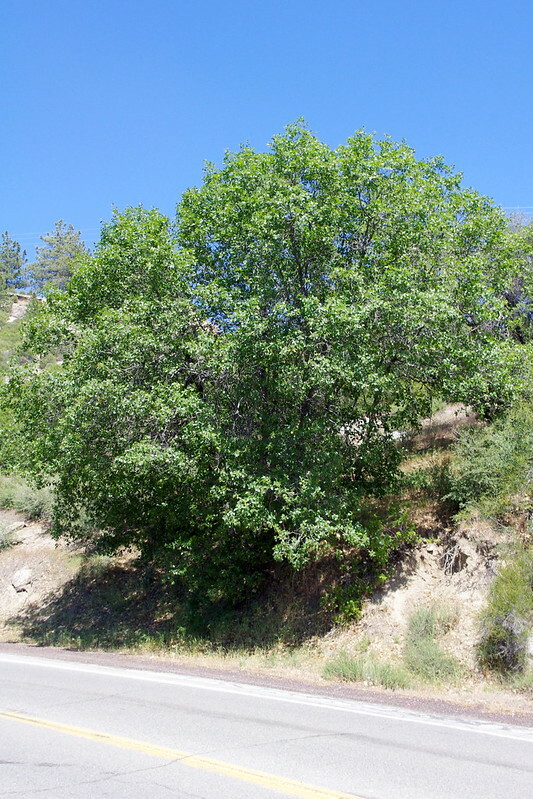 When I first moved to Idyllwild, I wanted to learn and identify every type of tree and chaparral shrub that ever existed up there. This is a close up view and scale to the leaves and their patterns. My first notice was actually quite by accident. I was looking for Black Oak acorns in the Fall of 1982 and remember this tree along the roadside. Another thing I remember about this unique tree was that I rarely found acorns and when I did, they were small and never viable. 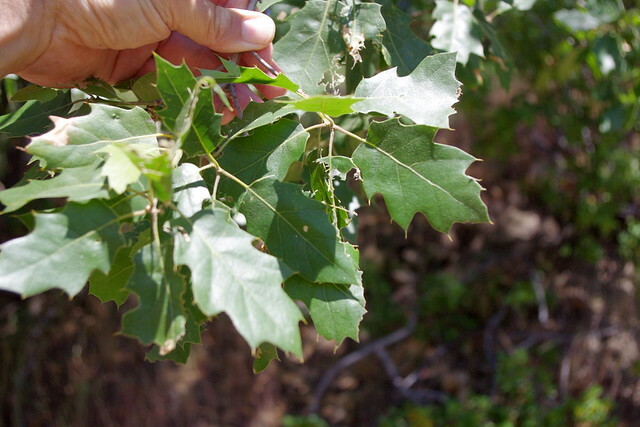 Of course after I identified it back in then, I went back year after year looking for just such acorn seeds to propagate and plant elsewhere on my property in Anza, but I always failed. These two photos above are from a roadside pullout on both sides where at one Time I imagine the County or State mined road building material. 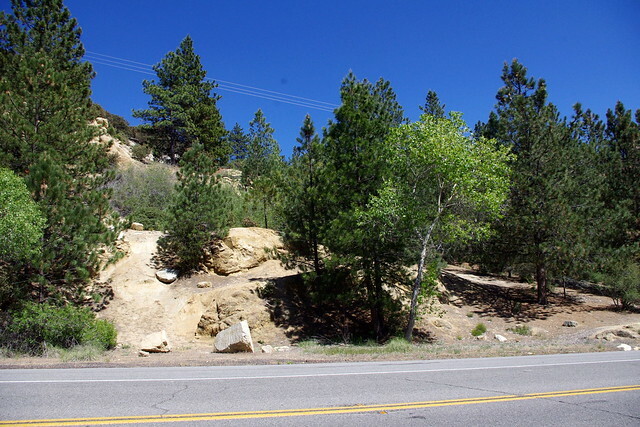 When I first moved up to Idyllwild, there was really nothing here, but bare granite rock and white decomposed granite soils. Everything looked so sterile. I remember all those years watching Pines, Cedar and Cottonwoods volunteer a come back and how Ceanothus and other Manzanita moved in, but later how the trees actually replaced all of those chaparral plants. 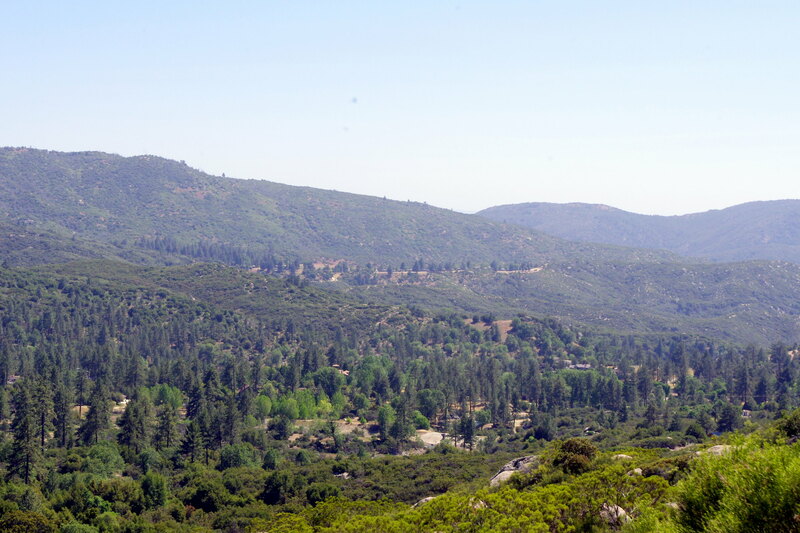 Incredible how Chaparral plays such an important component role in forest re-establishment. This area is popular with tourists in winter who want to slide down snow slopes. Well, finishing up here. I hope people slow down and take in the beauty of things around them in back country regions where they travel and appreciate that these things most likely won't be around much longer the way things are going with Human error which seems to be on the increase. I fear that the first photo of the lone roadside tree and gorgeous Redshank-Chaparral Honeysuckle combination may be gone forever. 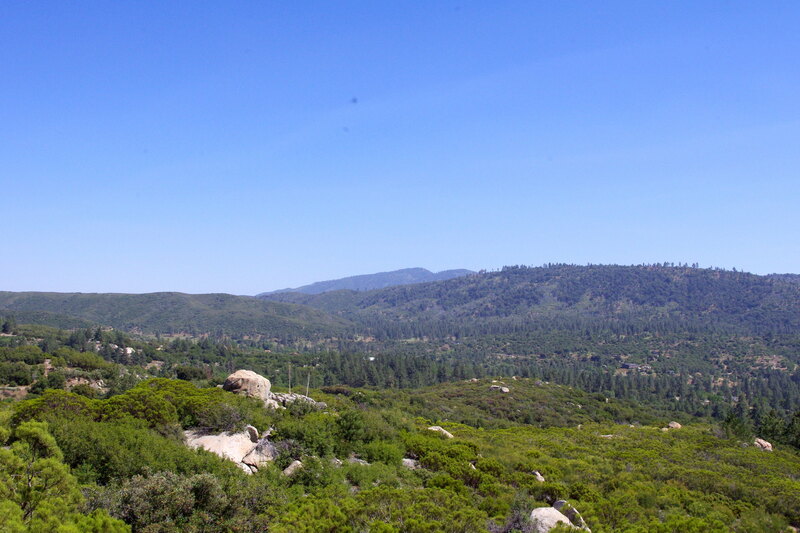 I've actually written Richard Halsey about taking a run up there and photographing it for the California Chaparral Institute's new website. I hope he can and I'm sure he will anyway to document this fire, it's origins and the Chaparral/Forest regrowth come back which hopefully will be as spectacular and nearly tripled as the 1982 Mountain Center burn. Although, that happened during periods of heavy winter rains and normal rainfall seasons. This no longer exists here either, so it may reveal a greater challenge or nothing at all. Below I have three photo links which will open up large for Zooming taken from a Strategic Turnout on Hwy 243 for viewing the entire Mountain Center valley region from McGaugh Road to the hills to the east where the fire direction headed. This location of the turnout is just past and around the corner from the green waste processing dirt road entrance. It would be great to do some before and after comparisons with these April 2013 Pictures and Mountain Fire aftermath if anyone would. Feel free to use these shots. Update 9:39 p.m. Due to the 1,000-acre fire burning Monday night in the Mountain Center area, an additional evacuation center has been activated at Hamilton High School, 57430 Mitchell Road in Anza, Cal Fire officials said at 9:30 p.m. July 15. Another large and small animal shelter has also been opened at Lake Hemet campground, according to Cal Fire.